While many writers dream of seeing their books in print, most don’t succeed simply because they don’t know the ropes. 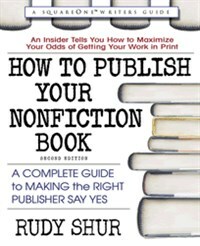 Written by a publisher with over three decades of experience, How to Publish Your Nonfiction Book was designed to maximize your chance of getting your nonfiction work published. The book begins by helping you define your book’s category, audience, and marketplace. You are then guided in choosing the most appropriate publishing companies for your work, crafting a winning proposal, and submitting your package in the best way possible. Special sections allow you to be a savvy player in the contract game, and fill you in on options such as self-publishing. Most important, this book helps you avoid the errors that often prevent writers from reaching their goal. Here is a proven system for taking your work from the desk drawer to the bookstore. Rudy Shur began his publishing career working for Charles E. Merrill Publishing Company and later William C. Brown Publishing Company. In 1976, he co-founded Avery Publishing Group, where he was responsible for the acquisition of over 1,000 nonfiction titles, many of which became bestsellers. Mr. Shur has lectured extensively on the topic of nonfiction publishing at numerous universities and colleges throughout the country. Currently, Mr. Shur heads the editorial program of Square One Publishers in Garden City Park, New York.